Underscoring the huge impact China will have on the global seafood industry in coming years, over the next decade, 53% of the increase in total seafood and aquatic product consumption in the world will be due to China, according to a new Rabobank report. The projection – outlined in ‘China’s changing tides: Shifting consumption and trade position of Chinese seafood’ – demonstrates how China’s massive — and growing — appetite for seafood could shake up trade, global M&A and pricing. 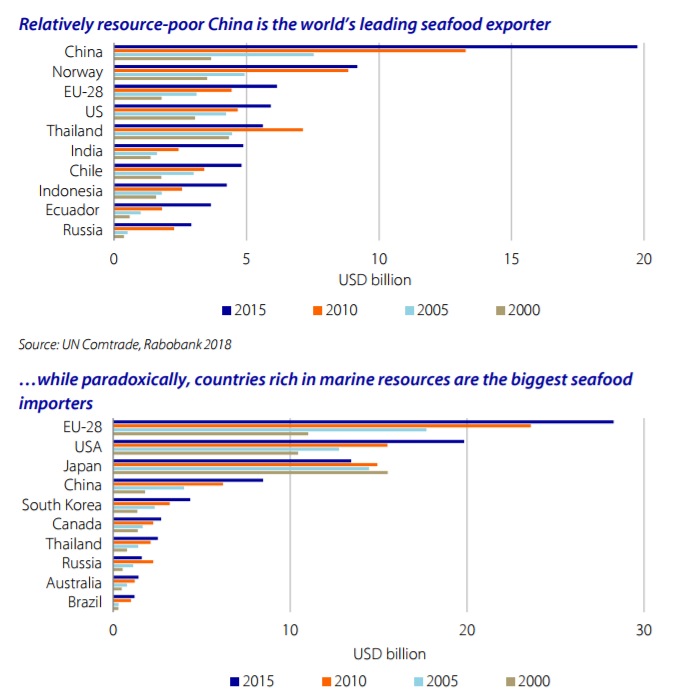 According to OECD-FAO statistics quoted by Rabobank, China already consumes 37% of global production of seafood and aquatic products; in volume terms, almost seven times higher than consumption in the whole of North America. It follows a remarkable increase in Chinese seafood consumption over the past decade — up 50% to 62 million metric tons, said the bank, contributing to 65% of global seafood consumption growth over the period. This has been driven by its huge population and high per capita seafood consumption of 44 kilograms per person – estimated to increase to 50kg by 2026 as consumption spreads more evenly across the country, thanks to e-commerce, better infrastructure and urbanization. Rabobank acknowledges OECD figures could be exaggerated, quoting industry sources in China who estimate consumption is 25% lower. But “even if this data is exaggerated by 25%, China remains by far the largest seafood consumer globally,” it said. One possibly key factor is Chinese are consuming more seafood, but production growth is stalling; the country’s shrinking labor force, natural resource constraints, disease and government policy undermines competitiveness of its huge aquaculture sector (see above graph), notes the bank. Its fishing fleet is also under pressure; China’s government has pledged to shrink the country’s huge fleet by 20,000 vessels and slashed fishing targets from national waters. Last month it pledged to maintain its distant water fishing fleet at 2016 levels. Last year, Cui He, president of the China Aquatic Products Processing & Marketing Alliance (Cappma) said Chinese seafood output is expected to shrink for the first time in 2017. 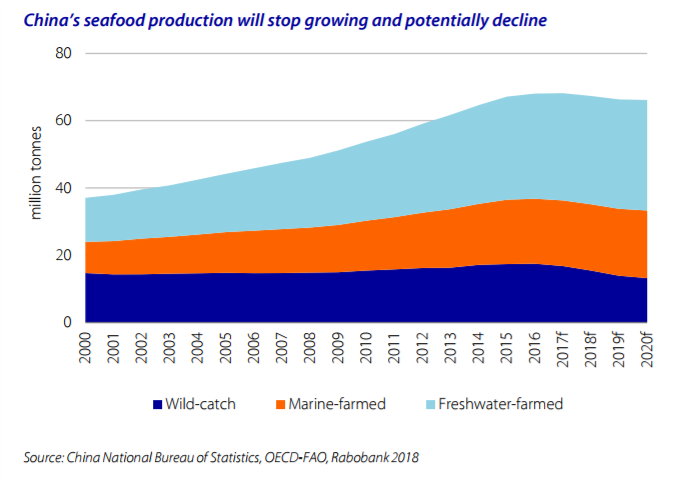 While long-term it is expected to grow, it is not presently clear how this will be achieved, although developing deepwater mariculture is on the agenda. Amid this huge consumption and stalled production growth, China would be expected to be in the big league of global importers, yet imports by the EU, US and Japan far exceed it, Rabobank notes. Between 2000 to 2015, China’s imports of aquatic products grew by a compound annual growth rate (CAGR) of 9.5%, according to Rabobank, reaching $8.5 billion in 2015. By comparison, the EU imported almost $30bn worth of seafood the same year. 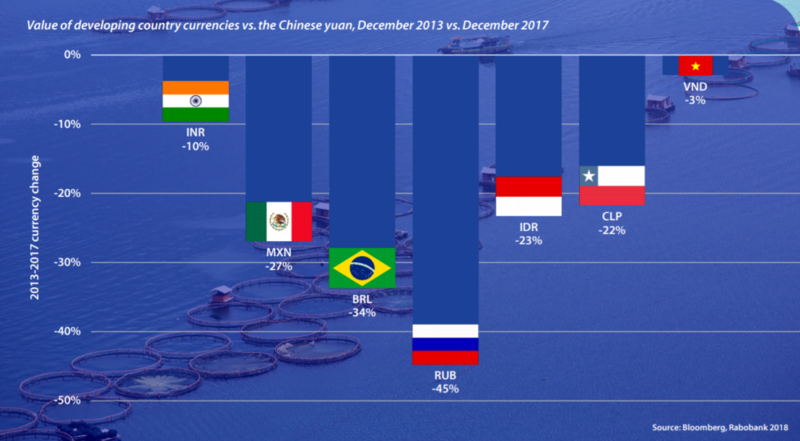 A large share of Chinese seafood imports are re-exported after being processed in China; 32% of China’s total seafood imports – supplied by Russia and the US, the top two suppliers to China — comprise substantially of whitefish such as cod, haddock, and pollock, most of which goes for re-processing. Fishmeal imports for China’s aquaculture sector account for another 25% of imports. 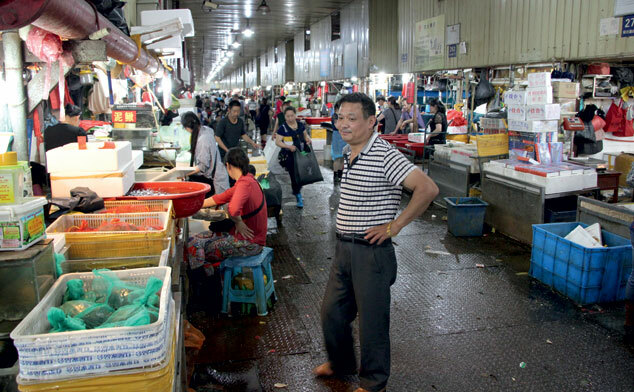 Unleashing Chinese consumption of domestic seafood on the world market could change this. Rabobank notes that, despite fewer pollution-related and adulterated food scandals in China, past scandals still undermine the food industry and support import demand. Consumers in the higher income bracket – who also tend to consume more seafood as a share of animal proteins overall – are more willing and able to pay high prices for seafood imports. China also enjoys a strengthening currency against a basket of emerging market economies’ currencies, it notes. China’s impact is being felt for some species; imports of crustaceans have increased by a CAGR of 23% from 2005 to 2015, said the bank. However, imports of whitefish and pelagics have grown less strongly – up by 4% CAGR over the same ten-year period. Rabobank does not mention whether import figures take into account the large, unreported ‘grey trade’, primarily between Vietnam and China. Chinese industry representatives estimate this trade at 1.6m metric tons. 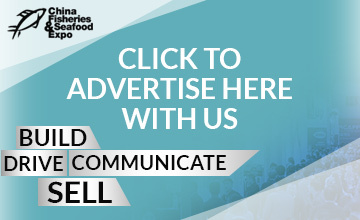 Last year, at the Asia Responsible Seafood roundtable, held during the Seafood Expo Global in Brussels, Belgium, in April, Cui He of Cappma told an audience China has already overtaken the EU to become the world’s largest importer, when this trade is factored in. Despite China’s potentially bigger role in future global seafood trade, Rabobank downplays the prospects of Chinese outbound M&A, at least in the short-term. 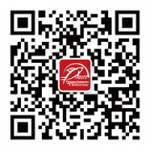 China’s seafood sector is fragmented and the current crop of market-leaders are relatively small, it notes. 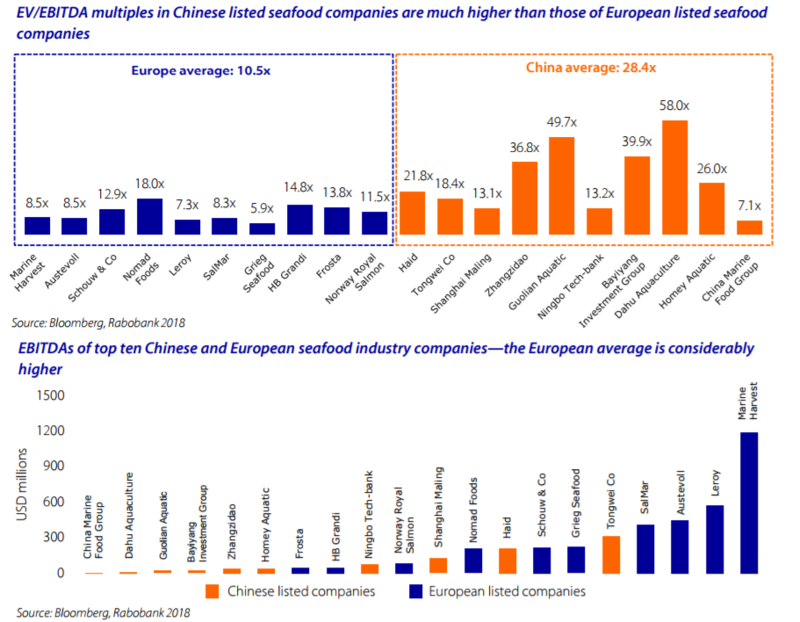 In 2016, Europe’s top-ten market-listed seafood companies reported average earnings before interest and tax (ebit) of $341m, whereas in China average ebit among seafood firms was $84m, it said. This figure includes revenues of firms not exclusively in the seafood or aquaculture space, such as Tongwei Group, a large feed producer. “We don’t expect a high number of Chinese inbound and outbound M&A activities to happen in the short term, due to the high value expectations for Chinese seafood companies and the fragmented structure of the Chinese seafood industry,” said the bank. Recently, Zhanjiang Guolian Aquatic Products, China’s largest shrimp company, told Undercurrent it aims to grow annual sales to $3bn by 2020, with half of that growth coming through M&A. Yet, in 2016, the company reported only a small profit.